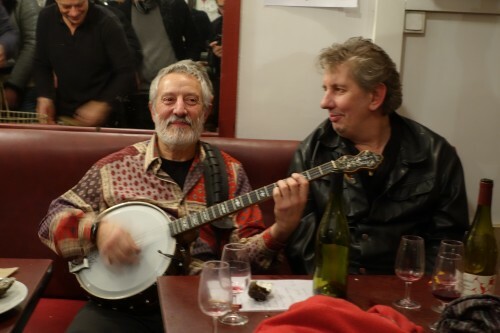 Loving the night of Beaujolais Nouveau in Paris is like loving country music. One is constantly obliged to explain oneself. No other genre of wine has been so rightly derided by the international wine press for its superficiality. And yet, as in country music, there remain practitioners of the form whose work attains a sublime simplicity, particularly when experienced in the correct context. 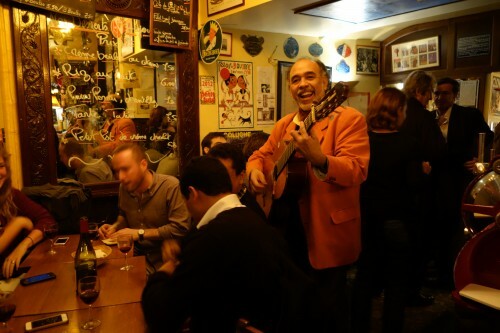 In Paris, at the right party, Beaujolais Nouveau is a transcendental event, a cross between Thanksgiving and New Year’s Eve, the one night of the year when an otherwise reserved and miserly population abandons its dime-sized, forward-facing café tables to stand around and sing and offer cheers to strangers. For the wine is so cheap that it lends itself to sharing. 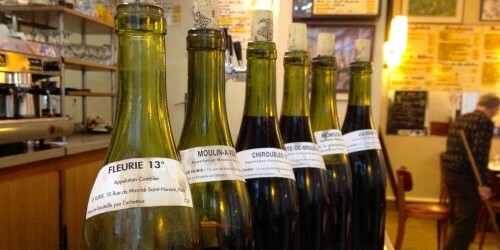 And the curious secret of the Beaujolais region is that its vanguard – the great winemakers who toil to redeem its reputation from the worldwide Nouveau hangover – still make some fine Beaujolais Nouveau themselves. The evening’s challenge is where to find it. What follows is a list and a map of Paris’ greatest Beaujolais Nouveau parties: places where the tradition of ringing in the New Year of the region’s wine persists in all its twangy, cherry-fresh glory. La Robe et le Palais (13 rue des Lavandières Sainte-Opportune, 75001) Owner Olivier Schvirtz and sommelier Loic Mougene throw what is possibly Paris’ last remaining quality-conscious midnight-release party for Beaujolais Nouveau on Wednesday the 20th November. The restaurant offers a 55€ menu paired with last year’s Beaujolais Nouveau until 11:30PM, at which point they bust out this year’s Beaujolais Nouveau, in the presence of a cavalcade of great winemakers. Beaujolais Nouveau from Karim Vionnet, Jean-Claude Lapalu, France Gonzalves, & Xavier Benier. Café de la Nouvelle Mairie (19 rue des Fossés Saint-Jacques, 75005) Benjamin Courty and Corentin Cucillat are the latest owners of this historic natural wine bar in the 5ème, which has changed hands over the course of its 20 years in business, but has always remained a destination for magnificent wine and simple bistrot cuisine. Saucisson Lyonnais and a daube de boeuf will accompany the gypsy jazz of Paname Swing and sought-after primeurs. Beaujo Nouveau by Guy Breton, Jean-Claude Lapalu, Xavier Benier, Karim Vionnet, plus vin primeur by Nicholas Carmarans. 7:30PM – 1:45AM. L’Entrée des Artistes (8 rue de Crussol, 75011) Owners Edouard Vermynk and Fabien Lombardi have the good fortune to celebrate their bar’s birthday each year on the night of Beaujolais Nouveau. This year the bar marks its third year of reliably drawing pretty much every major Beaujolais producer to its counter for gin & tonics after said winemakers get sick of their own wine. 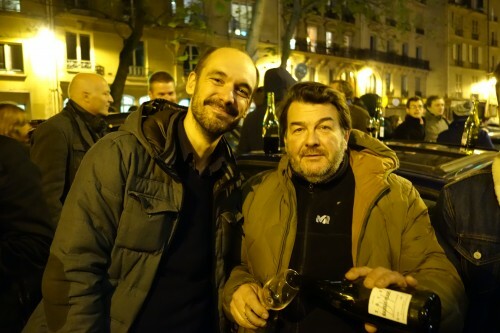 Beaujolais Nouveau from Michel Guignier (the one from Vauxrenard, not the one from Villié-Morgon) and Remi Dufaitre. Music: a vinyl-only classicist hip-hop DJ set. 7:00PM – 2:00AM. Ma Cave de Fleury (77 impasse Saint-Denis, 75002) Morgane Fleury, the fairy godmother of natural Champagne, hosts a rollocking Beaujolais Nouveau party with wines from France Gonzalvez, Jean-Claude Lapalu, & Remi Dufaitre, along with vin primeur from Jo Landron and Marcel Richaud. Music: Live fanfare (French traditional music involving brass instruments) from Les Charlots d’Eon. La Quincave (17 rue Bréa, 75006) Come for the Beaujo Nouveau from Karim Vionnet, Jean Foillard, Georges Descombes, and Kéké Descombes at this hole-in-the-wall cave-à-manger by Montparnasse – but stay for the crowd, which reliably consists of a who’s-who of the Beaujolais vanguard. Le Repaire de Cartouche (8 boulevard des Filles du Calvaire, 75011) Legendary terrine maestro Rodolphe Paquin celebrates Beaujo Nouveau with gusto. Beaujolais Nouveau from Karim Vionnet & Guy Breton, along with vin primeur from Thierry Puzelat. Music: A live accordian-guitar-chanteuse combo. Bottles will be priced at 30€ – but they come with free small plates all evening. 7:30PM – 1:45AM. 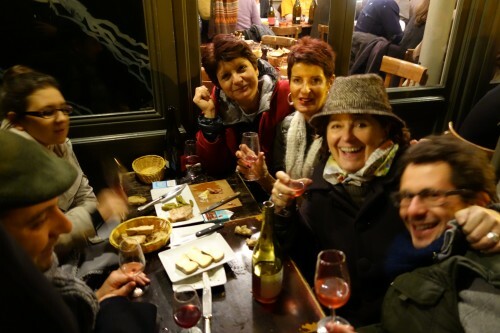 Le Rubis (14, rue Léopold Bellan, 75002) Marie Carmarans and Geraldine Sarfati, co-owners of unfathomably discreet natural wine bistrot Le Rubis, will be serving Beaujolais Nouveau by Jean-Claude Lapalu, Remi Dufaitre, Jean Foillard, and Karim Vionnet, alongside saucisson Lyonnais by Madame Sibilia and music by Le Rubis Swing Quartet. Don’t let the bistrot’s unassuming mien fool you: the bistrot’s central location and its owners’ impressive industry rolodex all but assure a lively evening. 6:00PM – 1:45AM. 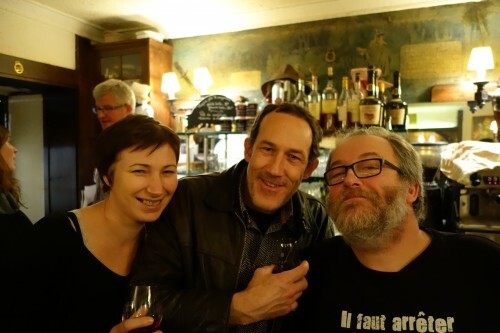 Aux Tonneaux des Halles (28, rue Montorgeuil, 75001) Proprietor Patrick Fabre has been throwing Paris’ most rocking Beaujolais Nouveau event for 24 years straight at his dirt-simple terraced bistrot near Etienne Marcel. Expect appearances by all winemakers involved. Beaujolais Nouveau from Marcel Joubert, Jean Foillard, Georges Descombes, France Gonzalves, and Kéké Descombes. Music: Live New Orleans jazz by Les Barriques Aux Rouges. Le Siffleur de Ballons (34 rue de Citeaux, 75012) Sommelier-restaurateur Thierry Brumeau’s neighborhood natural wine bar will go all out this year for Beaujolais Nouveau, with oysters, mini-croques, and a special t-shirt design on offer, plus Beaujolais Nouveau from Xavier Benier, and, most fascinatingly, a 3D art installation in the toilet by artist Alexis Cladière, a.k.a. 36RECYCLAB. All tables and chairs will be removed, with server-slash-DJ Alexie spinning by the doors. 6:30PM – 1:45AM. 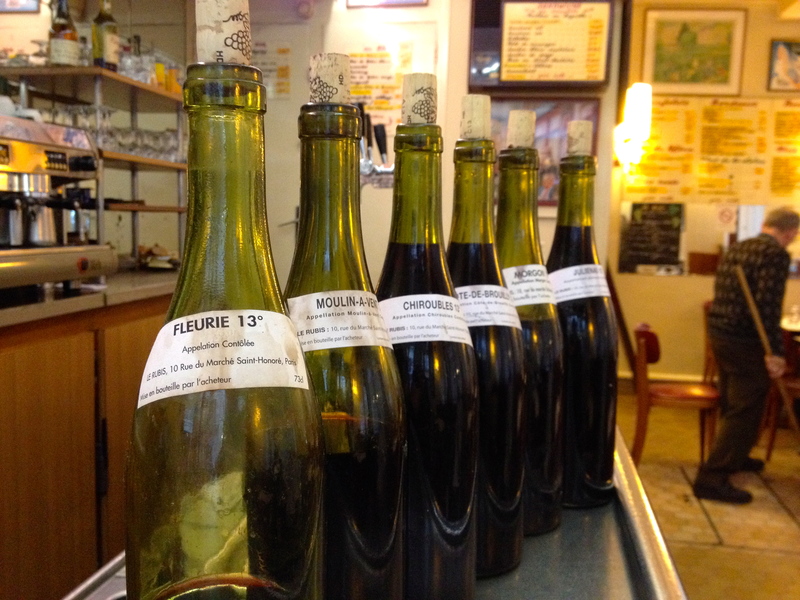 La Cave des Papilles (35 rue Daguerre, 75014) Gerard Katz’s venerable natural wine institution offers a tasting of vin primeurs that run the gamut of the viticultural regions of France. Beaujolais Nouveaux from Jean-Claude Lapalu, Karim Vionnet, and Sylvère Trichard, plus other vins primeurs from Jo Landron (Loire), Thierry Puzelat (Loire), Jean-Christophe Comor (Provence), Marchel Richaud (Provence), & Jean-François Nicq (Rousillon). Music: live jazz. 6:00PM – 9:30PM. Les Pipos (2 rue de l’École Polytechnique, 75005) Beaujolais Nouveau from Georges Descombes & Jean-Claude Lapalu. Probable appearance by Georges Descombes. Music: Live accordion. 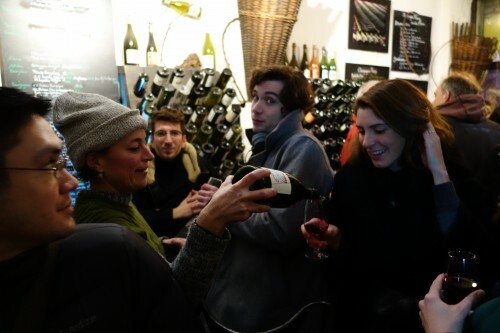 Le Garde Robe (41 rue de l’Arbre Sec, 75001) Up-and-coming Beaujolais winemaker Sylvère Trichard will be present, along copious bowls of free onion soup at this popular natural wine bar by the Louvre, at a soirée they’ve dubbed “Mojo Nouveau.” They’ll also be pouring Beaujolais Nouveau by France Gonzalvez and serving a round of ratafia (think French amaro, only sweeter) at midnight. Music: A live guitarist. 7:00PM – 2:00AM. Coinstot Vino (26 passage des Panoramas, 75002) All Beaujolais Nouveau will be served from magnum at Guillaume Dupré’s evocative terraced bar in the Passage des Panoramas. Beaujolais Nouveau from France Gonzalvez, Marcel Joubert, Raphael Champier, Sylvère Trichart, & Nicolas Testard. Music: a gypsy swing band. Juveniles (47 rue de Richelieu, 75001) Tim Johnston’s Beaujolais-themed menu service for the evening has already sold out. But the restaurant invites all and sundry for apéros until 8PM. Le Grisbi (138 rue Montmartre, 75002) Chef Bruno Schaeffer (ex-Café Trama) will be out of the kitchen and behind the bar at his brand-new bistrot, serving cheese, charcuterie, and Utah Beach oysters from Jean-Paul Guernier, along with Beaujolais Nouveau from Sylvère Trichard and Muscadet primeur from Jo Landron. Le Rubis (10 rue du Marché Saint-Honoré, 75001) Comically gruff proprietor Albert Prat will be serving the Beaujolais Nouveau from the same domaine he chose last year, Domaine Duvernet, at this time-capsule address near the marché du Faubourg Saint-Honoré. If you get sick of the fresh, fruity stuff, his unlabeled bottles of Côte de Brouilly still contain wine from appellation standard-bearers Chateau Thivin. The toilet may be Turkish and the service may be on the sunny side of ferocious, but Beaujolais Nouveau at Le Rubis’ zinc bar remains a fascinating glimpse into a world before Beaujolais became a bad word. Le Bal Café (6, impasse de la Défense, 75018) Co-owner Anselme Blayney offers the first glass on the house at his brunch-mecca in near Place de Clichy. House-made charcuterie and Beaujolais Nouveau by Pierre-Marie Chermette and Santini Frères, to the sounds of a classic 1990’s playlist. 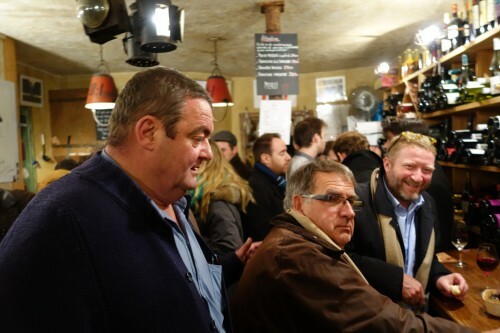 La Pointe du Grouin (8 rue de Belzunce, 75010) Owner Thierry Breton – who also owns the adjacent restaurants Chez Michel and Chez Casimir – will be splitting a full barrel of Lapierre’s Beaujolais Nouveau between his three restaurants. Beaujolais Nouveau from Marcel Lapierre. Le Vin de Julien (42 rue Condorcet, 75009) Beaujolais Nouveau from Christophe Pacalet, Cyril Alonso, and Sylvère Trichard. A 5€ entry gets you a tasting of the vins nouveaux plus a casse-croute campagnard (country-style snack). Le Mary Celeste (1, rue Commines, 75003) The Quixotic Projects group’s scenester seafood juggernaut will feature a micro-cuvée of Beaujolais Nouveau by Santini Frères, along with winemaker Chris Santini. A special menu of the restaurant’s takes on Beaujoloise classics plus Beaujolais cocktails will also be offered. 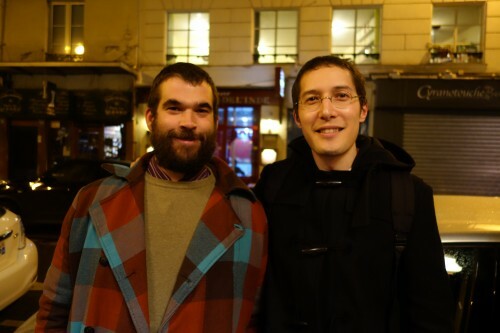 La Buvette (67 rue Saint Maur, 75011) Winemakers Marcel Joubert and Jean-Claude Lapalu will pass through at Camille Fourmont’s bright, thimble-sized rue Saint Maur wine bar, which will offer terrines from Rodolphe Paquin for the occasion. Beaujolais Nouveau from Marcel Joubert and Jean-Claude Lapalu. 6:00PM – 1:00AM. Au Nouveau Nez (104 rue Saint Maur, 75011) – Nadine Decailly’s discreet cave-à-manger will host a concert by all-girl woodwind group C’desmoiselles. 10€ buys a ticket to the show plus a glass of Beaujo Nouveau by Cyril Alonso or Nicolas Testard. Le Lapin Blanc (84, rue de Ménilmontant, 75020) Natural wine rabbit-hole Le Lapin Blanc will offer Beaujolais Nouveau by Isabelle & Bruno Perraud and Raphael Champier, along with a vin primeur of Dolcetto by Piedmontese domaine Lo Zerbone, and a Muscadet Nouveau by Jérémie Mourat. 7:00PM – 12:00AM. Ô Divin Epicerie (130 rue de Belleville, 75020) – Nafouel Zaïm’s new sandwich shack near the Buttes-Chaumont will be serving suckling pig sandwiches to accompany Beaujolaises Nouveaux by Remi Dufaitre and Jean Foillard. 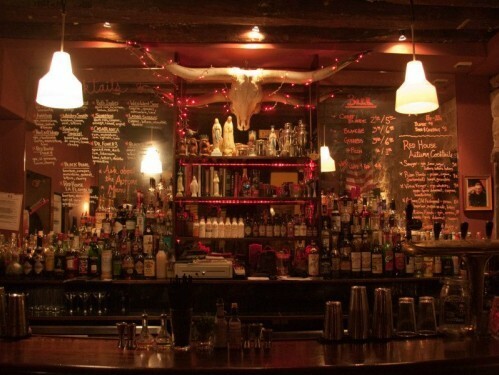 Red House (1bis rue de la Forge Royale, 75011) – But wait, some might cry, isn’t Red House an American bar? Owner Joseph Boley and his team nonetheless have embraced the spirit of the occasion this year, with a special DJ set and 3,50€ glasses of Beaujolais Nouveau by fellow American Chris Santini of Santini Frères. Les Caves de Reuilly (11, boulevard de Reuilly, 75012) Pierre Le Nen, the new owner of this storied address in the wilds of the 12ème, will be pouring Beaujolais Nouveau by Jean-Claude Lapalu, Remi Dufaitre, and France Gonzalves. The cave-à-manger’s distant location should be more than made up for by its vast, never-ending terrace. 5€ entry. 5:00PM – 12:00AM.